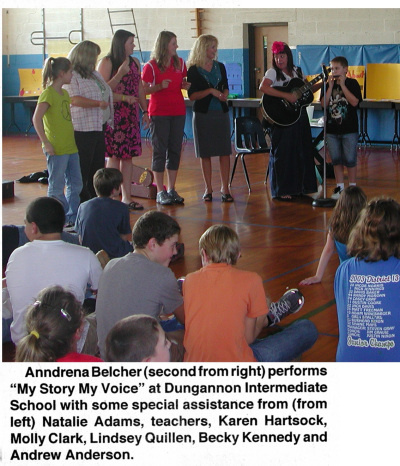 On Friday afternoon, Sept. 24, Jennifer Meade, principal of the Dungannon Intermediate School, introduced the performance of "My Story, My Voice." She explained that Anndrena Belcher, through a partnership of the school and the Clinch River Educational Center, had worked with the students to look at the teaching and traditions embodied in the life stories of home and family. "Everybody has a story, everybody has a voice," Belcher explained. Fifty-three of the 77 students chose to share bits and pieces of what they learned in interviewing their grandparents and other relatives or as Belcher calls them "elders." Some brought in archival photographs. Others drew images of family members, home place structures and local landmark structures associated with "living memory." Some of these stories included the "Old Black Bridge" which used to cross the Clinch River, the "Old Fincastle Church," which our young storyteller tells us is "haunted," and the "Railroad Depot," which used to sit "by the railroad tracks!" says one young man. All were remembered in different chosen, sharing formats. Memories of Fort Blackmore compiled by the students were "It washed away in the flood," bemoans a young male student, who lives down that way. "There used to be a barber shop, a bank and other shops. There was a lot going on there." Stories about homemade cakes, brownies, salsa, candy, pear butter, apple butter, lovely hand appliqued pillowcases, embroidery, a story sung or read, a living tradition captured in a handclap game, life on the Clinch River described in a fishing story --- complete with advice as to how to "cast your line, but don't throw the rod in the water! ", these and original songs along with the harmonica playing debut of Andrew Anderson, rollicking "backup" rhythm and singing by language arts and math teachers along with Natalie Adams made for a total learning celebration. Twenty-two students decided to speak in front of the microphone at this performance. "Speaking in front of a mic takes a lot of courage and trust in the audience and in the spirit of self," Belcher said. "Some parents and grandparents were in attendence. That is a big deal!" According to the Virginia Standards of Learning, oral expression, language arts, and social studies are integrated as each student looks at his or her own "personal history." "Everybody makes history," Belcher confirmed. "By having students identify image and emotion around personal story they are learning to trust "living memory." The elders have always taught by passing on skills, information, creative thinking and problem solving, through the natural day to day storytelling process. Every bit of information is not stored in a micro chip. Human beings possess many kinds of intelligence. We saw that here at the Dungannon Intermediate School!" Belcher likes to combine what she calls all the ways of learning. She has served as a touring artist for the Virginia Commission for the Arts for the past 20 years. The late Studs Terkel, author and oral historian, noted her importance in helping to preserve traditional family stories. "Anndrena Belcher is one of our secret national treasures," Terkel said. "We may have lost our tribal memory, at least for the moment. It is an artist like Anndrena Belacher who can help us recapture it." She will be performing at the Dungannon Intermediate School Fall Fundraiser set for Friday, Oct. 8, from 6 to 9 p.m. Some students may share their research at the festival as well. This Friday, Oct. 1, Belcher will be performing at Fort Blackmore Primary School at 1 p.m. Parents and other relatives are invited. Additional information abot Belcher can be found at www.anndrena.com or on MySpace. To contact her for bookings call (276) 494-2163 or email anndrenabelcher@aol.com. Published in Scott County Virginia Star, September 29, 2010.